Your child's daily learning shouldn't just be confined to the classroom, as it's important that they take in as much as possible from an early age. At TJ Hughes we stock a great variety of toys, arts and crafts items, and furniture – all of which will ensure their minds stay stimulated. Getting your children into the habit of thinking logically and solving problems is important, especially in the case of younger ones who have just started school. Our range of learning and education toys will ensure they get off on the right foot. We have fun jigsaws, as well as educational laptops and tablets that will serve as a nice introduction to modern technology. As all children learn in different ways, encouraging them to express their creative side is just as important as helping them learn how to read, write, add and subtract. We have a whole range of arts and crafts items that will allow your child to create their own pieces of art – from easels and crayons to loom bands and bracelet kits. 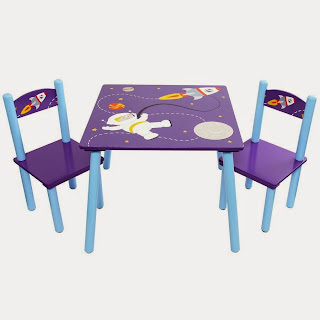 Our range of wooden children's desks will provide your little one with a piece of furniture that will encourage them to draw, read and write. As they're practically and classically designed, they'll fit right into any bedroom or playroom, regardless of the existing design or theme. For bedrooms with limited space, we have the Barcelona Bedsitter Bunk, which comes with a desk underneath. We understand how important your children's education is, which is why we stock everything you'll need to continue their learning at home at fantastic discount prices. If you'd like more information on any of our items, please don't hesitate to get in touch with our customer service department by sending us a query or calling 0844 576 0272. Alternatively, you can follow us on Twitter and interact with us on there.